One of the most nutritious foods around, eggs are the wonderful and convenient protein-packed simple food suited to a spectrum of occasions and recipes, from velvety scrambled eggs to Michelin-starred egg recipes. And of course, being a natural food, not all eggs are created equal. Depending on how chickens are raised and kept, from factory to free range and organic, deciphering between egg varieties can get complicated. Knowing more about chickens and eggs can help you to make more informed decisions, either as a consumer, or even if you're perhaps thinking of keeping your own chicken coup and collecting your own fresh eggs for breakfast. Whether the chicken or egg came first remains up for debate. What is true is that different breeds produce different quality eggs. This excellent guide is a great starting point if you're thinking about investing in your own chickens or wondering which hen is responsible for your favourite type of egg. Understand your eggs better with this useful guide to size, grading and colour, as well as breaking out of your comfort zone and trying duck and ostrich eggs! Learn more about egg labelling systems. 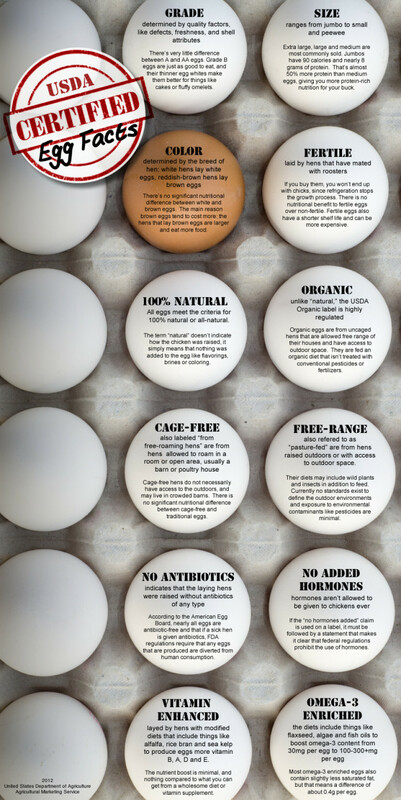 Did you know natural refers to eggs containing no additives or colouring, whereas if you want eggs from chickens raised with plenty of space fed on an organic diet, you should look for the official organic certified eggs? Top up your egg knowledge with some fascinating facts, from size to how many we consume. Binding, leavening, thickening, glazing ... eggs are good for a whole host of kitchen techniques. Find out just what you can do with the egg yolk, white and a whole egg below. Watch 12 delicious ways to cook an egg in this mouth-watering video that celebrates its simple beauty.